Background: Hair has been suggested since the middle of the 90's to be a suitable matrix to document repetitive exposure to cannabis. Because it is possible to detect Δ9-tetrahydrocannabinol (THC), cannabinol (CBN) and cannabidiol (CBD) in cannabis smoke, the identification of the metabolite, 11-nor-Δ9-tetrahydrocannabinol carboxylic acid (THC-COOH) has been considered to allow the discrimination of active use. Objective: Although the identification of an active compound in a child’s hair shows contamination of the local environment, it is a challenge to discriminate between hair incorporation after ingestion or inhalation and environmental external deposition from dust, smoke, or even contaminated surfaces by hand contact. However, it is particularly important in case of children to correctly interpret the data, particularly for a realistic assessment of the health risk. We present here a series of hair tests for cannabis where the interpretation was almost impossible to establish. Method: Hair specimens were collected during the autopsy of the 12 children, aged 2 to 24 months, either deceased from shaken baby syndrome (SBS, n=4), mechanic asphyxia (MA, n=1) or sudden infant death (SID, n=7) during January 2015 to April 2017. After decontamination, the hair specimens were tested for THC, CBN and CBD and THC-COOH. The whole length of hair was submitted to analysis. Results: The amount of hair from children can be as low as 8 mg. This may affect the limit of quantitation of all drugs, but particularly THC-COOH. Eight from twelve hair tests were positive for cannabis markers, i.e. THC (39 to 1890 pg/mg, n=8), CBN (< 5 to 1300 pg/mg n=8), CBD (10 to 2300 pg/mg, n=8) and THC-COOH (not detected to < 0.5 pg/mg, n=5). In 4 cases from 8 positive findings, it was not possible to test for THC-COOH (not enough material). Conclusion: Establishing a window of detection when testing for drugs in young children is a very complicated task. Hair from children is finer and more porous in comparison with adult (the risk of contamination from sweat and environmental smoke is higher than in adults). 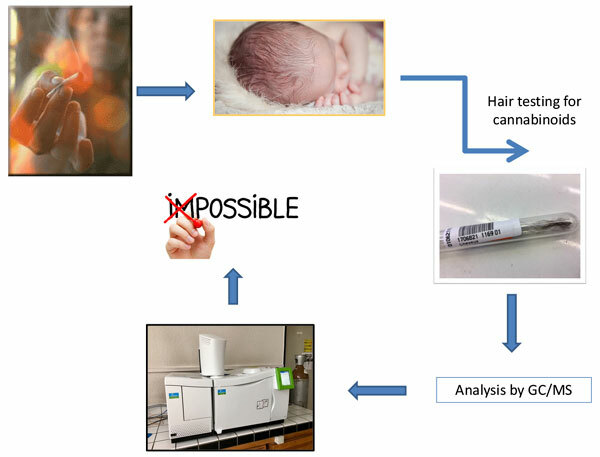 The final interpretation of cannabinoid findings in the children's hair is very complicated as this can result from in utero exposure (although none of the mother admitted cannabis use during pregnancy), oral cannabis administration by the parents to achieve sedation, close contact to cannabis consumers (hands, bedding, dishes) and inhalation of side-stream smoke. Over-interpreting cannabis findings in hair can have very serious legal implication in child protection cases. Practicing scientists have the responsibility to inform the child protection authorities, courts, etc. about these limitations. Keywords: Biological fluids, cannabis, children, forensic toxicology, hair, interpretation. Keywords:Biological fluids, cannabis, children, forensic toxicology, hair, interpretation. Abstract:Background: Hair has been suggested since the middle of the 90's to be a suitable matrix to document repetitive exposure to cannabis. Because it is possible to detect Δ9-tetrahydrocannabinol (THC), cannabinol (CBN) and cannabidiol (CBD) in cannabis smoke, the identification of the metabolite, 11-nor-Δ9-tetrahydrocannabinol carboxylic acid (THC-COOH) has been considered to allow the discrimination of active use.